Posted by Tantumblogo in asshatery, Basics, demographics, disaster, Ecumenism, error, General Catholic, horror, Revolution, scandals, secularism, Society. Ever since the “New Left” captured the leadership of the democrat party in the early 70s, both that party and its adherents have undergone a closely tied, two-element transformation – they have moved ever more radically to the Left, and they have become increasingly atheistic. These movements are not unrelated. Indeed, they are incredibly closely coupled – Leftist politics becomes a substitute religion for those who reject traditional morality informed by religious belief, especially Christian belief. Or, as I have noted in the past, leftism is religion for immoral people. That is to say, personal immorality, in the Christian sense, very often (if not invariably) both proceeds and informs those who develop and adhere to Leftist political beliefs. There are exceptions, but they are increasingly rare. Speaking across the broad spectrum of millions of people, my aphorism is much more true than not. Solid majorities of black Democrats as well as Republicans of all races describe themselves as Bible-believers, but the numbers fall off the table for white Dems — so much so that the number of white Dems who don’t believe in God at all is slowly catching up to the share that counts themselves as Bible-believers. 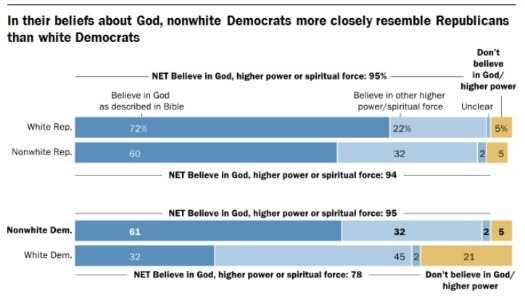 In fact, if you count the share that believes in some vague “higher power” or “spiritual force” as not belonging to a “faith” in any meaningful way, then fully two-thirds of white Democrats are post-religious. The share of white Dems that describe themselves as Bible-believers is so low that, even with a strong contingent of black Bible-believers, just 45 percent of Democrats overall say they believe in the God of the Bible. Effectively, the Democratic Party is post-Christian. Now, not to undermine my own point, but this data does not make sense to me. If 19% of Americans don’t have any belief in God or a higher power (are avowedly atheist), but only 5% of Republicans AND non-white democrats are atheists, how do we wind up with an overall population that is 19% atheist, when only 21% of even white democrats describe themselves that way? That would imply there is an even higher percentage of atheist independents, which doesn’t make any sense, either. This makes me wonder whether this survey was not severely skewed to include white democrats in its sampling – if Pew interviewed 80% white democrats for this survey the overall results would match the more detailed ones, but it would not be a valid representation of the nation overall. That aside, the collapse of Christian belief among white liberals/leftists is amazing. So is the divide between Republicans and democrats – goodness, white (native) Republicans are nearly 2 1/2 times more likely to believe in God than similar democrats. This is very troubling for the future of this nation, and points to the increasing irreconcilable differences between vast swaths of this nation’s population. I would like to see the age breakdown on those white democrat believers – I would hazard they are far older than the general democrat population. Which means liberal Christianity is dying breed – which our Church leaders should really take note of. The future of the Church in this country is not they and their cohort – it is those they loathe and have sought to ostracize and ignore. This month, Gallup released the results of their annual poll on religious practice in America. Gallup also noted that only 16% of Vermont’s residents reported being “Very religious”—a figure that was six points lower than any other state. If you look at the map of the poll’s results below, you’ll see that religious behavior tends to be a regional phenomenon. The most religious states in America are in the Southwest and Southeast—which is heavily Protestant—and the least religious states are clustered in New England and on the West Coast. After Vermont, the least religious states—in order—are Maine (55% “Not religious”), New Hampshire (51%), Massachusetts (49%), Oregon (48%), and Washington and Alaska (both 47%). Some of the least religious states are also states that have, or had, a substantially higher number of Catholics than the national average. Establishment Catholicism is dying as fast or faster than any major Church group aside from reform Judaism and a handful of “mainline” sects. One wonders how many of these new atheists are former Catholics. Probably millions. And what role have the attempts to radically redefine the Church into some nebulous humanist construct by the neo-modernist Vatican II crowd played in that unprecedented falling away? 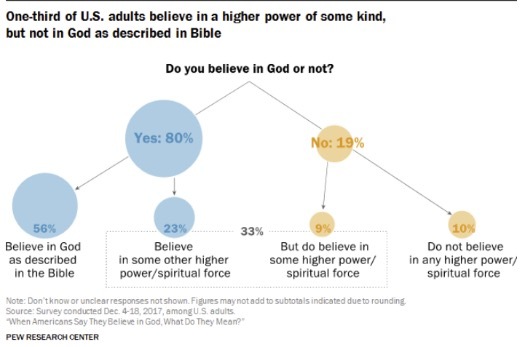 In spite of serious quibbles with the Pew poll’s methodology, the fact that a growing number of Americans describe themselves as atheists or non-believers is not in dispute. From low single-digits forty years ago to repeated surveys that indicate 15-20% self-describe as atheists today, a huge swath of the nation has never held, or in most cases fallen away, from some kind of belief, almost always Christianity of one form or another. Similarly, there is no doubt that an increasing number of Americans – and the number has soared in the last 20 years – embrace far left political views, largely as a result of thorough propagandizing in the schools and university. Historically and worldwide, there has been an extremely strong correlation between atheistic belief, and leftist politics. From the French Revolution through all the 19th century social upheavals through the communist empires of the 20th century and down to today, hedonism tends to presage leftism which leads to widespread atheism. It is unbelievably sad to see the nation I grew up in becoming everything it stood against when I was a kid, but there it is. Which is why I hate to say it, but an amicable, agreed upon divorce is about the best option I can see for this nation. I don’t see how two such radically different belief sets, and ones which are growing apart at an accelerating rate!, can long coexist in the same nation. What do you think, along that line? Is it simply silly, or unthinkable, to prophecy the breakup of these United States? Pending some kind of miraculous Catholic revival, is there any way to co-exist without increasing violence and disaffection from each side to the other? If they regain the presidency, will the democrats ever give it up again? (and mind you, the endless furor over the supposedly “unprecedented” immorality and illegality of Trump would have been applied to ANY other Republican/non-member of the statist monoculture who won – just as they are now rehabilitating the once “worst ever Republican” Bush 43 into a “relatively good one.” Remember the protests? Remember the assassination fantasies? Remember all the loathing and jeering from Hollywood and the statist media? And yet I heard Bill Maher over the weekend relate how leftists wouldn’t be freaking out to the degree they are if Trump were another Bush or a Romney. That Trump somehow represents a “unique threat to American democracy.” BUT THAT IS EXACTLY WHAT THEY SAID ABOUT BUSH! Just like they called McCain and Romney racists. Give me a break. The freakouts and attempted impeachments are just a means to the same end they are always after -power). I wasn’t going to comment here again, but dear Tantumblogo, you’ve gone way over the top this time.There may be a certain amount of domestic unrest in our future, and no doubt Texas separatists will continue to make some noise now and then, but there is no possibility of a “divorce” amicable or otherwise. For a start, most of the more liberal states are the more prosperous ones financially, and they help support the poorer southern states. There is no way the more conservative states could survive without that support, and our leaders know that. And if historians have rehabilitated the reputation of Bush 43 to any degree, I’m afraid it’s only because the present occupant of the Oval Office has given us new evidence of how “un-presidential” a President can be, and of the depths to which the office can sink. As for Hollywood and the media, getting the attention of the public is a big part of their job. The rantings from that direction, deserved or not, get attention .Freakouts can help garner power, if the people doing it can hold the public’s attention long enough. But most of the time the public’s attention span is like that of a toddler, and will just as quickly switch to something else. Even if Democrats retake the majority in both houses, which is far from assured, an impeachment is still unlikely. Even if Mueller finds impeachable offenses, they would still have to make something stick, which is another job entirely. And if they even considered it, they would first have to replace Nancy Pelosi, because if Trump went Pence would follow, and no one wants the national snit, on both sides, that a Pelosi presidency would cause. The fact that formerly Catholic states are becoming more atheistic is worrying. But I have to wonder how much of that is due to the reforms, and how much might be due to a more general move away from an identification with European culture. Even before the reforms, it’s indisputable that many Catholics were Catholics only because of their ethnic background. In other words, is the reform so unpopular or have “cultural Catholics” simply taken the further step toward atheism? I’m sorry about the long comment. I’ll wind it up by.saying I don’t think anything will change too much. Even if Democrats will the majority, I think there will be enough Republicans left to stop most of what they may try to do. For better or worse, the United States and the Catholic Church will plod on pretty much the way they are now. Well, there are exceptions in both directions (Texas is quite prosperous), and states which depend heavily on federal spending and employment (MD, VA, and DC) would suffer when much of the country underwriting that government goes away – but in any event, a “Flyover Country” nation could survive – they might just require a little belt-tightening. A great benefit here will be things these big swaths of the country do uniquely have that the coastal states do not – agricultural produce, water, hydrocarbons, minerals. These things might cost the new bicoastal countr(ies) more in such a situation than now. And they will still need them. These arguments can never be so broadly based as “Ha! Look! Red states consume more in services than they pay in taxes! Ergo you lose!” Well, perhaps federal regulations have stymied growth, perhaps many federal policies favor the kinds of industries that develop in blue states, maybe federal policy (and other levels of gov’t) have helped kill manufacturing in the US, which was heavily in what are now called red states. There are a thousand variables, and just to say “my side is wealthier NOW and pays more NOW under the current system” isn’t the foggiest predictor of how things would be in a radically different environment. The whole point of a divorce is to be able to throw off those onerous shackles that have hugely harmed the hinterland but had much less impact on the coastal locales. Read Victor Davis Hanson, he speaks of this at length, how policies imposed by the coastal enclaves have devastated the rural inland parts of California. Well, *California*, at least, would be in deep trouble, since it gets so much of its water and electrical power from out of state. And come to that, while it produces a lot of food, there are some holes it can only get from out of state. And you are right: Once you have separate nations, all bets are off. Everything starts from scratch to some degree. It certainly is a question of when, not if, the US breaks up. But that “when” could still be 200 years off. Who knows? Most likely scenario I see is a collapse of the central government due to some financial crisis, and not so much a divorce as a slow abandonment of central government with regional authority taking over. Maybe relatively painless; maybe not. The more liberal states look more prosperous on paper, but the reality is they do not have much in hard assets, so to speak. Finance, real estate, and other non-manufacturing, non-producing industries are what drive most of their economies, and those economies are built on a bubble aching to pop. Moreover, while individuals within that state may be prosperous, most of those state governments are bankrupt (e.g., CA). A lot of those states (VT, NH, MN) depend upon retirees and transplants, second/vacation home residents who would go down in flames if their retirement plans crash (you can sell only so much maple syrup). How will NYC feed itself if the dollar collapses and takes 70-80% of the NYSE value with it? The service sector can be perfectly honest work, but of course, you are right that much of the economy is a bubble and that the economy in New York, for instance, is completely unsound. What is concerning to me is not necessarily religion diminishing, but the hatred towards religion, specifically Christianity. I have been atheist for over a decade, having been raised in a moderate Christian household, and I’ve never had a vendetta against religion. However, during the last few years I have become more involved in online atheist groups and have been amazed at the amount of hatred many atheists have for Christianity. I consider Christianity to be important for America’s heritage and therefore deserves a level of respect. I often find myself defending Christians despite being an atheist. I think most religions and atheism can certainly get along, the problem is can leftism get along? The out right hatred you are concerned about is not good, but the highest form of hatred is indifference and a go along to get along attitude. Satan has those tightly in his grip. Please rethink your disbelief in your Creator. We know what St. Paul says about those who lack of believe in God. Your eternity is at stake. I am really interested in what makes atheists hate Christians the way they do. Please tell us. I would really like to know and I’m sure many others would too.